A mobilization of SMART members urging the passage of a state two-person crew bill in Maryland made their voices heard on Thursday (Feb. 7). The bill, which requires two crew members on freight rail trains, was introduced by Delegate Dana Stein, who represents Maryland’s District 11. Testimony from Kasecamp, SMART TD Designated Legal Counsel Matt Darby, the submission of more than a dozen letters of support from affiliated unions by Donna Edwards, president of the Maryland State & D.C. AFL-CIO, and additional testimony from first responders, local elected officials and Local 631 Legislative Representative Tom Cahill helped to compel the committee. 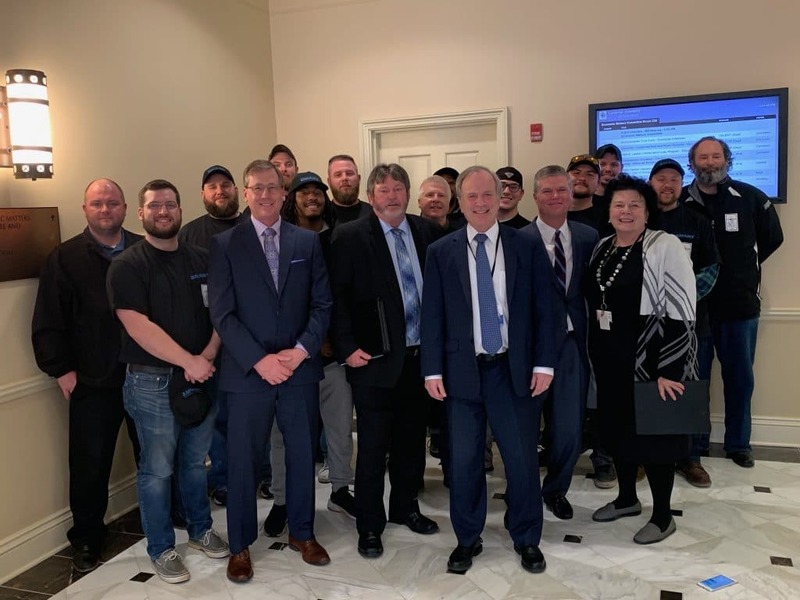 SMART Sheet Metal and Transportation Division members and other supporters showed up to advocate for HB-66, the state’s two-person crew bill, Feb. 7. Center is Md. SLD Larry Kasecamp (blue striped tie); at Kasecamp’s right is the sponsor of the bill – Md. Delegate Dana Stein (Dist. 11); DLC Matt Darby; and Donna Edwards – president of MD State & D.C. AFL-CIO.